Attaching a model to the Shape Sliders is used to test how your model reacts to the SL Appearance Sliders. 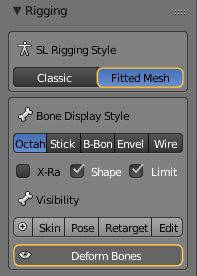 Note: If your custom mesh shall be used only for a specific shape, or when you are confident that your mesh is properly weighted, then you can fully ignore this feature. In this workflow i use a dress as my working Custom mesh. It has been designed to match the default Avastar character. 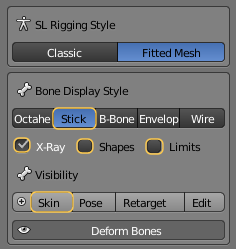 Its weights have been optimized for fitted mesh, hence it already contains weight groups for Collision Volume Bones. Note: The sliders do not directly change your mesh! We use Blender’s shape keys instead to store the influence of the sliders on your mesh. Hence however your Custom mesh changes while you modify slider values, these changes can later be fully reversed or applied (see below). 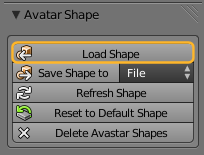 Apply: When you click on this button then the current shape of your mesh will be baked into the mesh itself. Technically we apply the slider shape keys to your mesh. X: Cancel all slider changes on your mesh. Thus you get your mesh reverted to its state just before you attached the sliders. Note: When you cancel the Sliders (press the “X”) then the Avastar shape will also be reverted to its values just before you attached the sliders! Then we have one more button for Shape refresh. When you press this button, then your mesh shape will be recalculated based on the current weight values. This button comes into play when you are editing the Collision Volume weights. 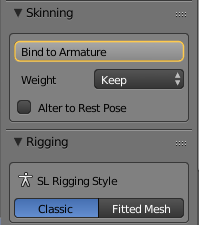 You will press this button whenever you want to see how your changes on the weight maps influence your Custom Mesh. The Shape file also contains information about the Character’s gender. Occasionally you will want to apply all your slider changes right into your mesh (provided you have attached the sliders to your mesh). 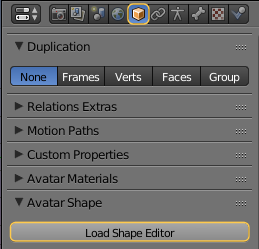 Note: This feature is most welcome when you want to create multiple variants of a mesh for different base shapes (e.g. to support the Standard size shapes published from several creators of SL Garments). 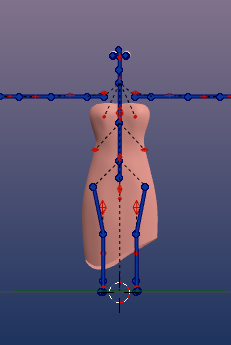 When an Avastar armature is in the Default shape (standard female) when we attempt to attach the sliders, then the baseMesh and the currentMesh are almost(*) identical. Hence we know the baseMesh in this case by definition. But when the armature is initially in any other shape (like the gnome shape for example), then the baseMesh (default shape) and the currentMesh (the gnome) differ significantly. Now the problem is: the calculation of the baseMesh is not as straight forward as it may look. But we found a way to recalculate the exact baseMesh from the currentMesh and the current Slider values. And once we have the baseMesh, we can again precisely calculate all meshes for any slider setting. (*) SL would not be SL if it had not added yet another easter egg here. Actually the Default shape of Avastar differs slightly from the BaseMesh. And this is the reason why all calculations become so complicated and why we had so many troubles for months. But we finally have solved this puzzle. So no worries, we got it to do what we want. The Basis: Is the initial mesh as it was when the sliders had been attached to the Mesh. The neutral_shape: Is the BaseMesh. this is what Second Life will later use as basis as well for its own calculations. As expected the neutral_shape looks almost identical to the dress as it looked in the Avastar default pose (see above). So, after we have found the exact baseMesh we now can take the “Gnome Dress”, attach it to the Gnome Shape, then reset the shape to the default Avastar shape, and since the dress is attached to the sliders, we end at the default Avastar Dress again. Thus we can now do a full round trip between 2 arbitrary slider settings. And here is how it goes when we continue with the gnome shape. and locate the Sliders panel. You simply attach the Custom mesh to the sliders by click on the Attach button. Please be aware that attaching the Sliders may take a few seconds However this slowdown happens only once for the initial slider attachment! Max iterations: Limit the number of iterations for calculating the best matching mesh. You see the resulting mesh is not distinguishable from the initial mesh that we used to start this workflow (see far above).